You can prevent employees from entering any time off requests entirely on the SETTINGS>Global Employee Permissions page. But if you would like to let employees request time off, you can also set certain dates to be blocked – so that they cannot ask for time off on those dates going forward. 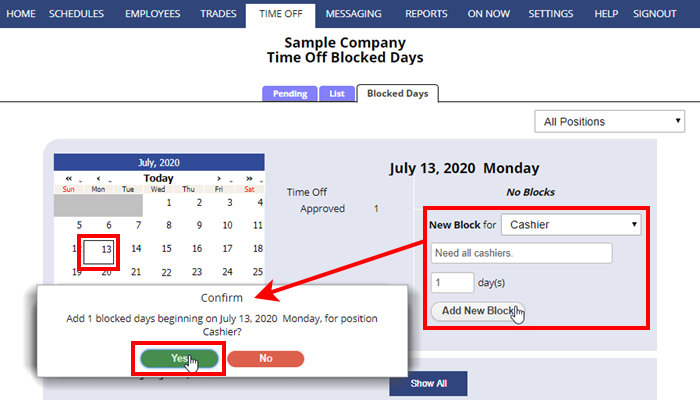 You can block time off requests for all employees (all Positions) or just certain employees who can work certain Positions. So for instance if you add a time off block for one Position “cashier” on December 3, then any employee who is allowed to work the cashier Position will not be able to request that date off going forward. Managers with permission to BOTH “Approve / Deny Requests” AND “Change Company Settings” can add time off blocks. If you do not see this option please contact the account main manager. In the top menu choose TIME OFF> Time Off Blocked Dates. The Blocked Dates grid below will now show the new block for that date. Now employees for that position will be prevented from submitting new time offs for that date. Also the TIME OFF>Pending Time Off page will show an alert if any already submitted request is for that now blocked date. To edit the manager description of a block – double click in the grid description and make the change and then click Save. Note that if you have enabled employees to see Everyone’s Time Off on your SETTINGS>Global Employee Permissions page, they will see both a list of approved Time Off requests and a current count of how many requests are pending for that date already — so if they know that there is a limit, they will have a good idea that you are at or near that limit when submitting their request.